Weaving it together – the final chapter. Boris Balkan:Â Now you can watch! You can’t come with me… I must travel alone but you can look on and marvel. Dean Corso: That’s very kind of you. Boris Balkan: Indeed it is. There have been men who have been burned alive or disemboweled for a glimpse of what you are about to witness. Now we’re almost at the end of our epic-campaign guide and towards the end we got a key to success back hidden here. Let’s hope you find it useful since unless you’re already doing it with an actionplan and timeline you might find the concept a little strange and uncommon. 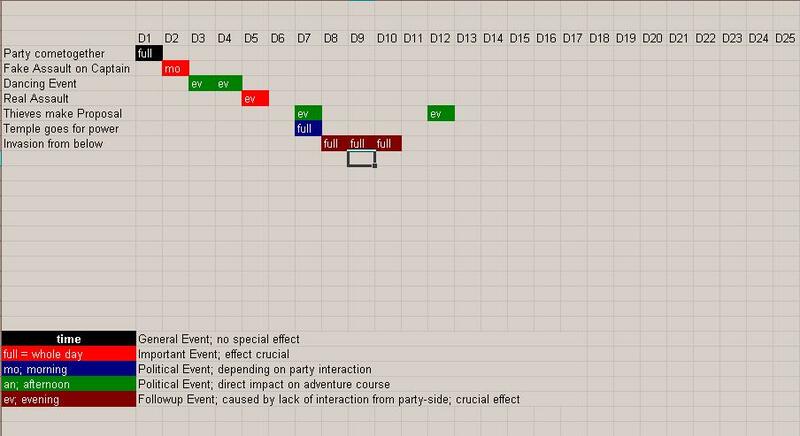 The actionplanÂ should be yourÂ final planning tool and bring together events, npcs, factions and influences they have on your game.Â You will find a lot of different ways howto implement this into your game and visualize what you need to know. I chose an easy project diagram with a spreadsheet tool. The colorcode easily gives you an approach to mark everything according to their importance, you can use traffic-light-colors or whatever you feel comfortable with. I suggest especially for the first use of an actionplan to get yourself a short legend (see picture bottom) to make sure you know how crucial an event is and when / why / what effects you expect. Usually I just work with a colorcode without much more but I tried to figure out what could be useful when you’re either newer to dungeonmastering or prefer to plan more instead of improvising a lot of the whole plan. So I figured most important additional information will be to have a timing of events. My approach would be a general information “full day – morning – afternoon – evening”, not a lot more since you might want to change a few things on the fly to reward players for alternative thinking (you will encounter this more often than not and will hopefully be surprised several times by the creativity of your own players… I always am). It’s easy – because you’ve got some really powerful characters running around and politics are always interested in having the big ones on their side. So we’ll have a close look to the politics of various groups, regions and perhaps individuals that are parts of it. Â That doesn’t mean you’ve to be the best diplomat and you don’t have to prepare a kingdom’s daily business (though if you like to think about this, it might be helpful as well). What it means is, you should prepare long-term and short-term objectives for every nation involved and for every party involved. 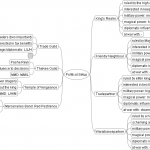 I’ll give you once again an idea of what I’m talking about with a small mind-map (I tend to find Freemind still useful ;)). 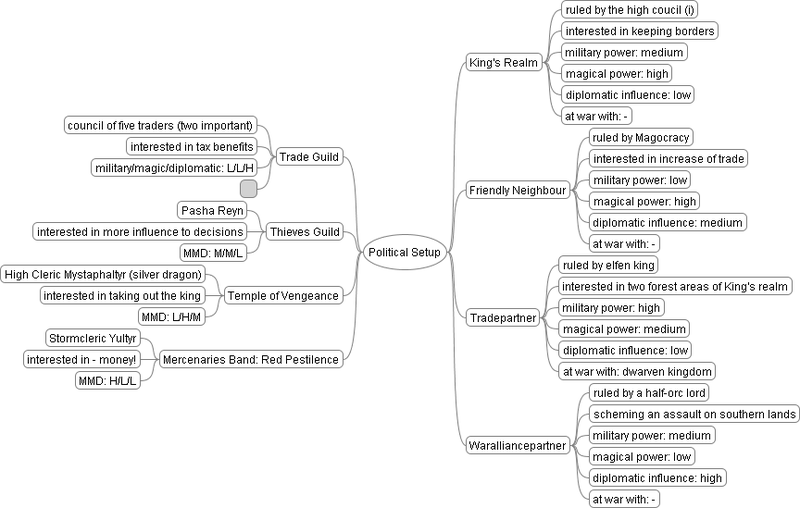 First I’ve set the most important nations on one side of the mindmap, if you’re dealing with more than 4-5 I suggest you use a single mindmap just for the nations-setup. And then I put a few smaller organisations into it, this can be everything from a group of adventurers to the high temple of a new or old faith. Your main focus should be to find a few possiblities for interactions between those factions. There may be old enmities or new ones that are based on whatever you can imagine. Maybe the old guildleader was in perfect favor of a god and the new leader has failed to show his proper respect (in gold…) so far. 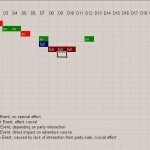 There’s a lot of potential for side-plots and those will lighten up your game – these small tidbits of background information should be a core task of your preparation, that’s why I put it so late into the whole setup scheme. You will need to know a few npcs from every faction, if you haven’t done that so far, you might want to put it onto your npc list as well, I guess names and some strange habits will suffice, a thieves guild leader who doesn’t like rats or has a real phobia of darkness will make your players smile for a moment, that’s usually a good idea as long as you don’t make this a general status quo in your campaign. (The weird things, not the smiling). Now it’s all about you making plans for the adventure, you’ve got a lot of stuff already prepared or created, use the mindmaps of characters and their ambitions – use those of guilds and factions and use the region. You can start a war or try to have the players avoid one, you can undermine the authority of the king by having several guilds work together. What should you always have in mind when it comes to politics? perhaps it’s time you look back to the different motivators and have the political figures have motivations on their own. As you probably know yourself, love is one of the strongest out there as is hate. When it comes down to a royal court, these emotions may be hidden well (have a look at yesterday’sÂ necromancer, who himself is part of a king’s council…) Don’t make a blunt attempt on weaving everything together, it’s something to use with a plan, the classic mage that fell in love with the king’s daughter can make a great villain or ally. He has no real chance to get what he is looking for and you can make him the gruesome old wizard who tends to take what what he thinks is his (though he knows that he will have to trick the king in seeing something completely different) or make the wizard a handsome young fellow who knows his love is lost to him and give him a chance to express his feelings to the characters after they helped him or vice versa. I suggest you spin a few intrigues with the council, intrigues are shiny when you play them against unfriendly characters and they tend to be vile and unfiar when you play them against friendly ones. Use this position to get an unexpected turn in your adventure – your epic party has saved the friendly young fellow that’s the realm’s foremost wizard and soon to be advisor to the king. He helps defeat a vile scheme ongoing for many years against the king and becomes his chancellor or must trusted counselor. A year later the king is hardly the same, he seems to wither slowly and die out of no plain reason and suspects he is being poisoned by…. (some familiar person) – in truth it’s the wizard who is keeping the lifesigns of his king low to rule in his stead, and maybe he never was the handsome friendly fellow but a great impersonator… There are countless possibilities for you here, use them! a most important feature on your npc chart for political stuff will be the amount of ambition and the interest every character has. The handsome wizard we’ve been mentioning (third person :)) before might be the king’s advisor and a powerful mage though he is very young, when he poisons the king and slowly drains the life to get a hold on the kingdom it might not be of his own motivation, it might be the Yugoloth behind him that granted him power and supported his magical ascent in the first place that came to ask for a few small boons which the mage in his young years granted the demon. Maybe you have a few hidden forces and factions behind everything – I just advice you not always take the same driving forces, once your players learn of them it will start to get a bit mono-coloured and straining a topic hasn’t done a lot of good when you have virtual endless possibilities for change. Howto extend your experience in this? Politics are not every gamer’s favorite, I guess in our time it’s obvious that many people tend to ignore politics as something they have no influence in. Still in real life it’s true and in fantasy campaigns as well, the ones that hold power have ambition and usually some plan – may it be a great virtue or just another blunt approach to get more power. In the game politics will increase your fun factor if used wisely since it’s nothing more than another net of game-depth. You can use official events – couriers and courtesans, you might like official events like a ball (dancing event) or a formal meet and greet with another ambassador. You can declare war and peace and the good thing in games this doesn’t hurt a single individual while increasing the satisfactory level of your players greatly. Have fun preparing and I hope you’re looking forward to the last two chapters of this series when we create the action plan and go together through the whole preparation process once again. The whole series (links to the posts will be active after publishing of them). You hopefully still remember part four of this guide where we took a few (more or less) random characters and interweaved them to our player’sÂ character-backgrounds. Now we will take a closer look onto a few of them and add some more to make this a bit more like a real-world. Not everything is epic. I know this isn’t conform to 4e rules where you adjust difficulties with character level (I stop the rant immediately, honestly), but one of the most important keys to an epic game is – make the players feel special – even more special than they did in your normal games. They wield a lot of power and you should not step in and cut their power by taking countless as-powerful-characters out of your mighty-book-of-npcs. Honestly, with that in mind you should start np-character generation. So what is your job now? You take this whole list and map it out for a few stats, (this is where 4e was very handy – the short preparation of stats). Then you think about what villains and the other npcs need on their own. You might start a mindmap of your own with all important network he needs, but you will end up fletching out around 5-20 characters depending on the social aspect and how much you like to improvise during your games. I’ve seen a lot of great blog-postings lately, which focus on villain creation, Bard of Valiant and A Butterfly Dreaming both have started seperate articles on this aspect so you might want to look up their posts. This is where prestige classes come in very useful for me, it’s all about shaping a villain and the special abilities of certain prestige classes are great to add some variety to a game. Usually I would go for a concept start (e.g. necromancer) and will try to find something with a special touch – Pale Master would probably one of the first to think about. I’ve found at necromancergames.com the freebie download section very interesting. They got a Corpse Caster, a gruesome caster who at certain power levels can transfer wounds he suffers himself to specially prepared corpses. At the same homepage you find a conversion of the Death Master – another start or addition if we prepare a necromancer here. Don’t forget there is a “official” book on necromancy as well, called Libris Mortis. But usually you will find more material than you can imagine on virtually any direction you want to take it. Useful stuff: shares a history with Player1 (childhood friends), was always the better wizard.. transformed the town of Miklaa close to (Cityname) into a wasteland and has acquired the souls of all former inhabitants has bargained high and is a favorite of (evil god’s) playthings lately – on the other hand he has earned the scorn of the goddess of death and mortality for capturing so many souls. His favorite phrase is: “Ye must be not yerself young boy…”, he even referred to the king in this way when old (Kings name) proposed an attack on (another country). and so on, that’s very much how I would setup a villain’s note in my gm journal. I hardly need a lot of stats, spells or items, though I would probably use the generator of dm-genie to get one on the fly during the preparation sessions. Most importantly don’t stress the abilities of your villains. I’ve read a few postings on DMPCs lately and I have to admit, I’m not particularly fond of DMPCs myself. As soon as a player gets the impression he isn’t in the middle of the game and you’re favoring npcs over the players – I suggest you give the Dungeon Master’s seat for a while to another player on your table. This is one of the most favorable positions a dm can have – the resting place to regather ideas and create great adventures for future use. So, you’ve got one – now get the other 4-19 😉 – have fun creating your characters and make sure to have not too many of these munchkin over-villains in your repertoire. In the coming days we’ll have a look at the political setup of our world (sounds incredible boring, but it isn’t – honestly). Hope you enjoy the series and keep reading if you do. Now we got a basic network of persons, a world and everything about your players set and ready… This part of the guide will help to get yourself prepared to keep your players busy and yourself not always on the edge of your imagination. You’ve got the background stories at hand, they might have a short paragraph on their youth, someone they didn’t like – someone they liked very much – what keeps you from getting this particular NPC as a villain into your game? It will be a hell of a roleplaying opportunity when they are meeting face to face, prepared for combat and one of your players recognizes him as a dear old friend (or the one that always stole his lunchbox…, you get the idea). Don’t be afraid to (if it is possible in your world) resurrect old dead people, let them follow a greater calling – they make for mysterious encounters and can tell stories of places the characters might want to see in the future. A formerly dead cleric might have seen the other side and remember bits of it, he might be mad or not that’s up to you – but it gives you outstanding starting points to add some atmosphere to some special place you’ve always wanted your players to visit. Most of them will be due to character backgrounds and the inter-character or character-npc ties, if you ain’t got information from your players that suit you, speak with them – if they like roleplaying I doubt they will not help you in this and accept your ideas. Vengeance makes a great motivator, you’ve lost something that seemed incredible important to you? Think about it, make sure you understand what you do to a character that was a witness to the slaughter of his hometown. Your players might react in different ways to such things – no matter if they are past or present – so you should prepare it together with them. Oh Love is great, I mean – really. Love is something that’s happening far too seldom in roleplaying games that I’ve been a part of, I think it’s most often too much of an implication for real-life things and gets troublesome thoughts inbetween players (again, just an assumption here). I guess NPC/PC love is the best approach you can get, even the lowly streetliving girl from years ago might inspire a spark of something greater in your players if they really felt for her in a special way. Love can lead to a lot of other strong feelings depending on what happens in your world. Just make sure you don’t always let bad things happen to beloved ones or you will generate probably a little frustration. A loved one can be in need of something and doesn’t always have to die by the hand of the evil archvillain dragonlich – that’s clicheeeeee! I’ve seen a lot here, players who create their background stories always the same way, with parents dead, rest of the family slaughtered and hey I can tell you those guys make great loners ;). But on the other side I think family and friends is something everyone of us has a strong need for, so once again don’t abuse background stories that give you potential “to-be-killed” victims but use them in a more positive way. The family can be a great resource for items or a good start for your wizard’s tower or laboratory, just be creative. Honestly, who hasn’t played on this sin before? It was the one motivation that drove me when I started roleplaying, gold – items – power – Ahaha Ha! *insert really evil laughter with dark echoes*.Â Since you’re the one that knows your players best, you might know as well what motivator is good for every single one of them. Get it straight, you’ve probably a few players who always wanted the Staff of Might or Robe of the Archmage – this is your chance to use their own motivation to get your story going. Ever had the players lighten up a village, kill some innocent bystanders? Then you might want to give them a chance for redemption. Or reminder your players about the village they helped before and who are once again asking them for a favor… It’s always possible to create some major plots and machinations around small ones. Don’t feel bad to use these feelings – it will be for the good of your players. Even if you put real stress on some of these motivators, you’re using it to create something for them. Just don’t play them worse than need be, if someone is attached to his character and you ruin this character’s life by taking away everything he ever needed – that’s not going to improve it for either of you! Second thing I like to have close is my folder. What is in it? First chapter is a list of names for dwarves, elves and all things you can think of – it’s a collection to get the right name for the spontaneous need – I wouldn’t go anywhere without it. Next chapters are various things, spontaneous encounters and sideplots, all kinds of magical items – and most importantly a collection of names for all special points of interest – temples, taverns and more. Next chapter is my personal favorite – it’s a collection of fantasy-setting meals and menus – that’s purest flavor for every game you have – honestly – serve some roasted griffon filet for a few gold pieces, it will taste like chicken but it is something to talk about… (unless it’s standard anyway). THen I got a good collection of poisons, traps and riddles for all occassions. It gives me a good idea every now and then to get things started. First of all, have some encounter lists, you can find several useful in the dungeon master guides, dm genie (software) is helpful getting them to work or use a sheet of paper and take a random screening through your monstrous manuals… This will keep a (depending on your mood and planned amount of combat) game with a decent amount of fights. More important than ever will be that you give your guys a clear sign of being overpowered, a mighty wizard (like Paul S. Kemp‘s Creation of the Sojourner) should be very – VERY – obvious if you don’t want a direct confrontation. At least that’s true for most of my groups so far – if you don’t have that big nasty sign “I blast you and you don’t get a saving throw if you come any closer” out they will go for it. In my understanding, combat encounters will be more an element of flavour and less a challenge for epic campaigns, at least that should be true for most plots. Do not underestimate what a single opponent can wreck upon your players if he is that powerful, and be aware that most creatures that powerful have more of an idea why they survived that long than the average orc out there. Good luck on this one, I hope the ideas will help you a bit further. So you’ve got your world up and ready, now we get back to a bit character work, by now you should know your characters pretty well and probably they know each other well, too. It’s your part that you enhance your player’s work by adding additional contacts and build a network with good and evil guys. Just get a few names for now, we’ll fletch out the np-characters on one of the coming days.